In Greek mythology Ganymede, a beautiful shepherd boy, was abducted by Zeus, in the form of an eagle, and carried off to serve as cup-bearer in Olympus. 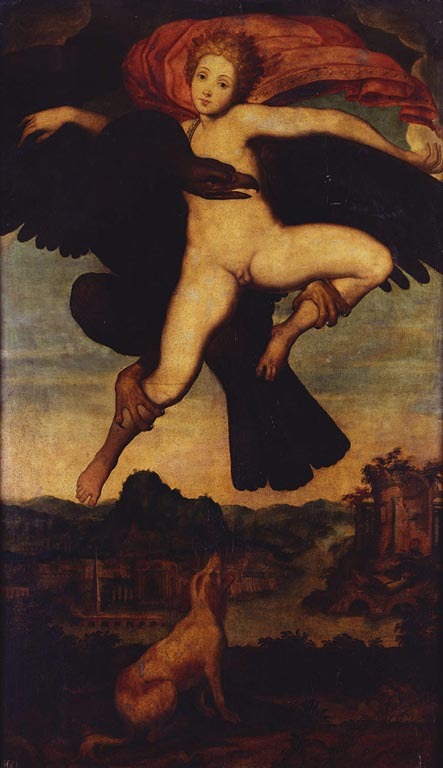 Naked but for a robe billowing out behind him, Ganymede is lifted by a large black eagle holding him by the ankles while he holds the top of the wings. Below, a small white and brown dog barks at the airborne group, and in the distance is a landscape of ruins. This painting is thought to be by Netherlandish artist, presumably working in Italy as the panel is of poplar. The composition comes from a drawing made by Michaelangelo for his friend Tommaso de’ Cavalieri in 1532.